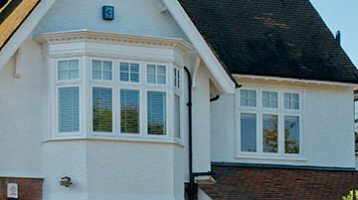 Cheam Windows lead the market in Surrey and London for Timber Effect Windows. We are delighted to announce our new Flush Casement Window. The window offers the authenticity of timber with all the advantages of PVC-u. Our Timber Effect Windows give you the look of traditional timber windows with all the benefits of PVC-u. Have you ever wished you could have the look of traditional timber windows and doors with the durability and security of a modern PVCu product? You can with the new Flush Casement from Cheam Windows. This lovely window has been designed to replicate the look and feel of a traditional timber window. With it’s front to back sizes it will be the only window currently available that will fit into many UK homes even where some timber can’t. Made to replicate traditional timber windows, our Timber Effect Windows also offers the latest in security with Bi-directional roller locks, keeps and shoot bolts as standard. Monkey tail handles and casement stays are also included for that authentic look. Side hung windows use the Cotswold friction stay. A high quality hinge that allows the entire sash to slide sideways when opened. This enables cleaning of the outside of the sash from inside. The window also has low a line glazing bead with low-profile gaskets for improved security and greater sightlines. 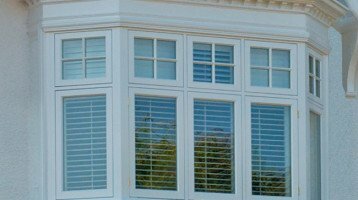 Any style of window is possible, including, bays, bows, special designs and much more. Timber windows are beautiful hand made products, but many customers can be put off by the higher price they command over pvc. Most timber windows sold today are flush casement products. The Cheam Flush Casement Window enables you to enjoy all the advantages of an authentic looking timber window at a fraction of the cost. Perhaps you live in a home that has flush casement windows that need of renewed but you need to keep the original look of your windows. The Cheam Flush Casement enables you to do so. You can create bay windows, bow windows and one off designs as well as dummy casements, astragal bars and much more.